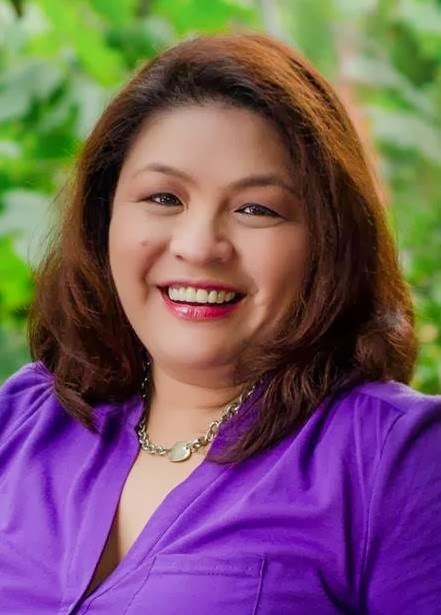 Oh my goodness, we think alike so much, Malou ! 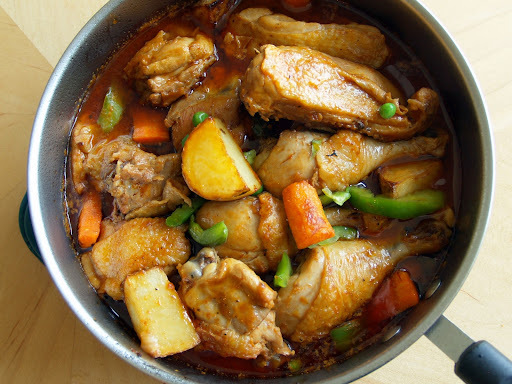 I just made Chicken Afritada! Your photos are gorgeous and make me want to come over right now. Thanks for the post...so nice to read! I love Chicken [A]Fritada though I must admit I cook it rarely. I love everything about it except for the chicken, LOL. The sabaw, the veggies, oh YUMMY! This made me really hungry! I'll cook it the way you do one of these days and I'll send you a photo! Thanks for sharing! Great recipe Malou. Thanks for posting. Have a great day. Aww that was a sweet post. And the afritada looks so yummy. I am so happy to be discovering these authentic dishes from the Philippines here; next time I am in Lebanon I will make this with my filippino friends. Awwww, so sweet! I know I am already old and yes, I/we do those things...and we find it fun. 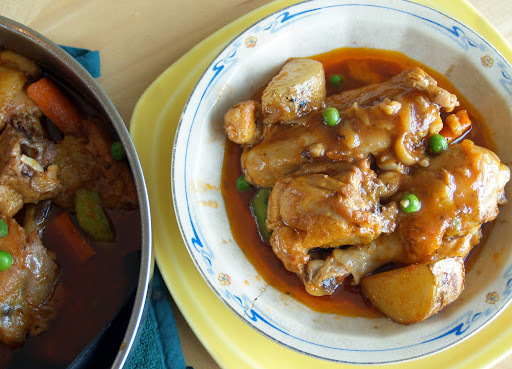 The only afritada I know is fish afritada so I should try this recipe 'cause it looks absolutely delicious. Bn: Wow really haha.. I'm sure your hubs loved it. K: Hello great to meet you! J: we need to find some humor in our relationship right? Im sure you and your hubs do the same thing. J: Great to see you back. It's been awhile! Your Filipino friends will be surprised to have this haha! A: you don't look "old" as well hihihi, Also I never had afritadang fish before... hmmm would love to try it. Your chicken dish looks delicious... I'm pretty sure good food can help persevere our youth too! I haven't been blog hopping in a while... it is so lovely to see you back online. Z: that's the spirit.. hey happy birthday again..enjoy! C: Great to see you again. I know it's been awhile. R: Anytime Reb. I am here if I could help. Hmmm another delicious recipe! Thanks for posting - I bookmarked and hope to try this fall/winter! Nami: you are so sweet... and glad you tried my arroz ala cubana recipe. Terra: I know what you mean, but you're right, let's enjoy life! haha I don't think this means you're getting OLD. It just means you're beginning to appreciate the little things in life. I'm down with that! This chicken dish sounds so delicious. Your husband has awesome taste. I must be getting old too, because I do the same thing, go grocery shopping Friday nights, and funny enough I get a slight thrill out of it. 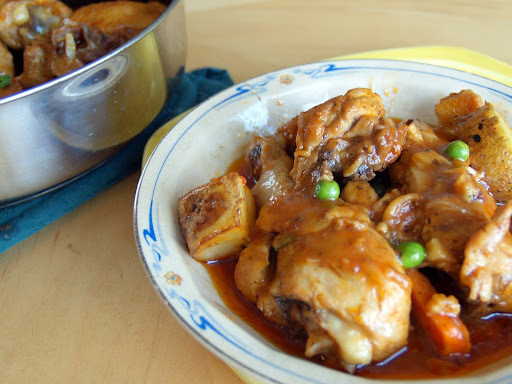 This looks like terrific one pot meal! You know you're getting old when every chicken comfort recipe posted is a "must do." As this is. Hi Malou! I just found this recipe the other night when I was trying to decide what to make for lunch the next day. It was a big hit! I'm now officially a fan! 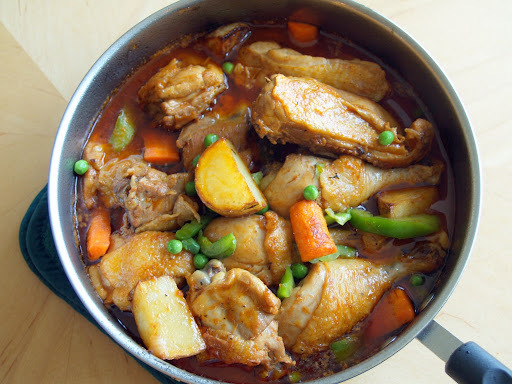 I've never made chicken afritada before and your recipe was simple, easy to follow and tasted really great. 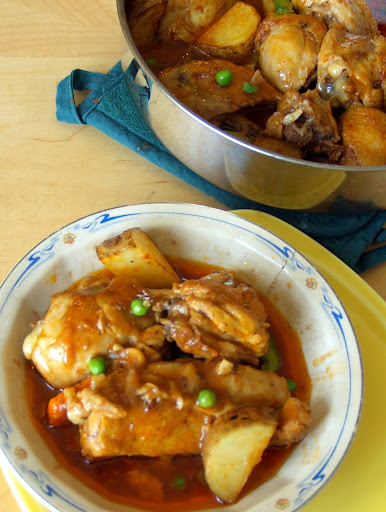 Just a comment though, when I tried to look it up again, this recipe was filed under chicken caldereta. Thought you might want to check this. Cheers!